Solar power system is a power generation system which uses solar cells to convert solar energy into electrical energy directly. 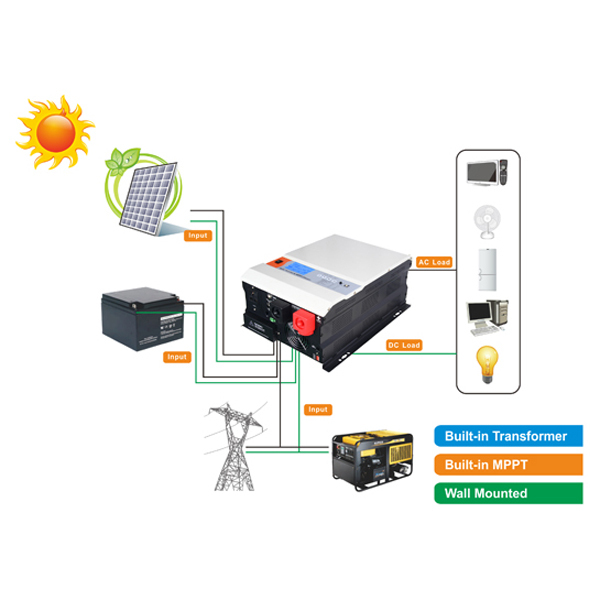 Its main components are solar cells, batteries, solar MPPT charge controllers, and solar inverters. Solar power generation process is simple, no mechanical rotating parts, do not consume fuel, do not emit any substance including greenhouse gas, no noise, no pollution; Solar energy resources are widely distributed and inexhaustible. Therefore, compared with wind power, biomass power generation nuclear power generation and other new technology, solar power is a most ideal feature with the sustainable development of renewable energy power generation technology. Installing distributed photovoltaic power stations to provide for the parents can reduce the economic pressure and contribute to environmental protection. For local governments, the promotion of distributed photovoltaic power generation in line with national development of new energy development direction, but also solve the pension problem of rural elderly. Conventional energy sources are limited both in the world and in china. Chinese disposable energy reserves are far lower than the world’s average, only about 10% of the world’s total reserves. Solar energy is inexhaustible inexhaustible renewable energy, clean, safe, fully aware of the relatively extensive, really long life and free maintenance, resource adequacy and potential economic advantages, in the long-term energy strategy has the important position. 13.Mains/solar/ mains & solar charging three mode of priorities for the customer to choose .